Whether you’re ready for it or not (not sure how you couldn’t be ready for it), spring is almost here! That means three things. No more adding whipped cream to your coffee, time to dust off that gym membership, and bolder colors and prints are back in style! 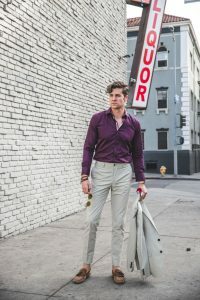 I’ve partnered with the awesome people over at Vastros, a San Francisco based menswear brand intent on leaving the bland, boring choices we’re usually faced with in the past. 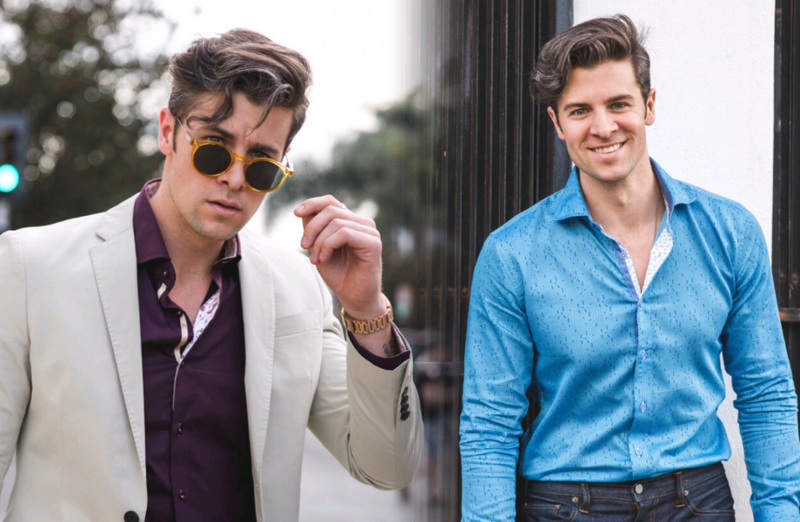 They’ve created a line of shirts that are a perfect blend of bold, quality, and comfortable so you can look and feel great while also making a bit of a statement. The reason I wanted to work with them is because I really appreciate their interest in providing an option for the guy who likes to express himself but also still needs to look presentable. 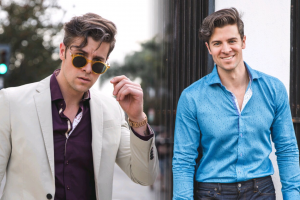 I styled two looks in their shirts and I want to run through them so you can see that going bold doesn’t need to be a majorly ambitious move. It can be done with subtlety and taste. Being that purple (and it’s many shades) is my favorite color, I couldn’t resist this shirt when I saw it. It’s bold but also not shockingly so. I also love the small amount of detailing on the placard (where the buttons are). One of the main things you want to focus on when trying out something bold is to surround it with muted pieces so that the boldness factor doesn’t go too far. I wore a few accessories, but ultimately the outfit isn’t that loud aside from the shirt. 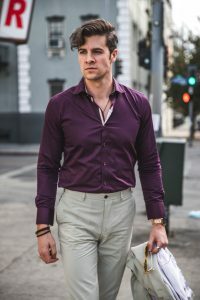 By styling the shirt with a khaki suit, the purple is really popping. Imagine if I were wearing this with a blue, black, or worse yet, another bright color. It wouldn’t look right with the purple. Something about shades of brown and purple mix really well. The better you can get to know your color blocking wheel, the better you’ll understand how to create strong outfits. The footwear is also in the brown family and it’s comfortable while still being a bit dressy, just like the whole look. Letting the bold shirt do the majority of the talking is how I can make it work. If you try to start styling the bolder piece with other bolder pieces, you run the risk of looking sloppy and ultimately a little silly. Check out this shirt here. If a suit is too much, I’d recommend some khaki chinos or a light wash pair of jeans with white sneakers or brown dress shoes or boots. 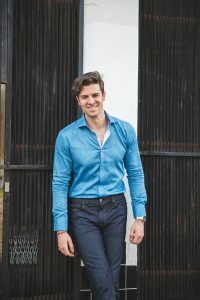 Although blue is one of the most approachable colors in the spectrum, especially for dress and casual shirting, this one still manages to be bold. 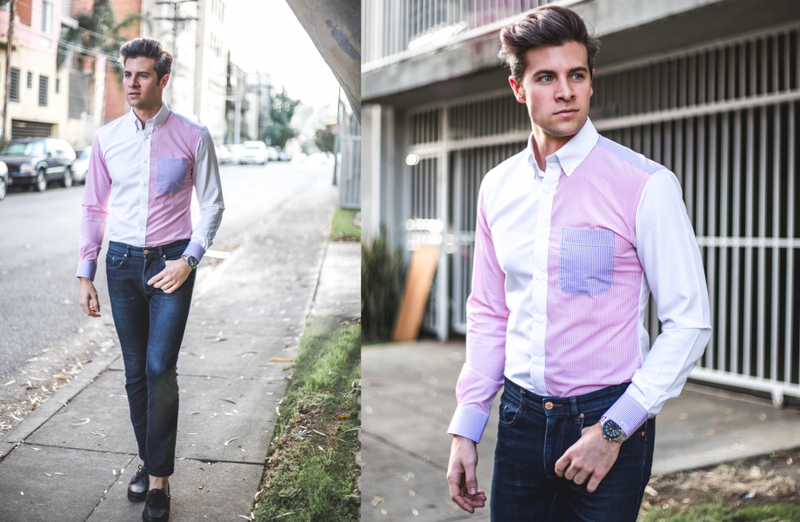 The subtle pattern adds some dimension and differentiates it from a typical blue dress shirt. 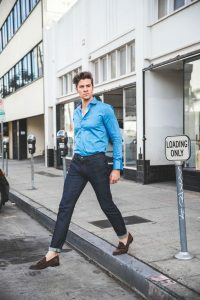 I wanted to style it in a way that I see a lot of guys dressing themselves – jeans, a button up, and some dress shoes. For whatever reason, this is a very comfortable way for a guy to dress himself and feel like he’s stylish, but not stepping too far out of his norm, which I love. Anytime people are willing to push themselves just a bit outside of their comfort zone is a win. 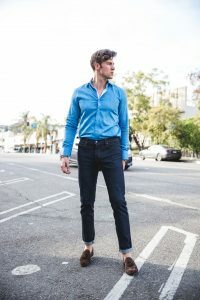 By styling the bold blue shirt with some traditionally darker jeans and dark brown loafers I’m ready for pretty much anything the weekend has to offer. I kept the top and bottom in the blue family, so I wanted to switch things up with the brown shoes. Again, because the shirt is on the bolder side you want to be sure that the rest of the look is pretty tame – color wise. Don’t have competing pieces of boldness. Also, because everything fits, you’re going to be able to show off your physique to the ladies (or gentlemen) but you also aren’t throwing it in their faces with a skin tight v-neck tee like a bro. Undo the top few buttons and let some skin show. 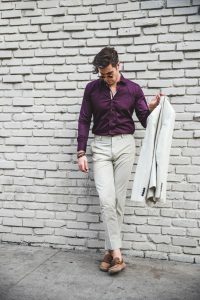 If you’re carrying a little bit of extra weight around your midsection, just untuck the shirt and maybe roll the sleeves a couple of times. Don’t be self conscious about buying something slim. You can make it work for you by making small adjustments. Check out this shirt here. Also Vastros has TONS of other great options if blue or purple aren’t your jam. Check them out and use code PARKERYORKSMITH at checkout for a discount on your order!